In early 1995, the Czech Republic enterprise Transgas began a campaign to overhaul energy resources within the Czech region. They called upon vendors to refurbish existing underground storage of natural gas near the town of Stramberk, Moravia. The need for the upgrade resulted from an increasing demand for natural gas, which varied depending on the season. The project required the construction of a new compressor station for exhausting natural gas supplies from existing storage. The project would also have to provide for additional natural gas storage capacity, especially during the harsh winter months. CKD Praha Energo, Prague, Czech Republic, was chosen to supply a machine train for the natural gas replenishment. 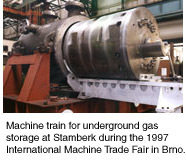 The machine train included a 3RSC56/3RSD56 centrifugal compressor, a GT 3000 gas turbine from a Ukraine-based vendor and a control system from an American supplier. A number of other vendors took part in the project, providing necessary equipment for the compressor station. One of the suppliers, Kingsbury Inc., Philadelphia, provided the LEG (Leading Edge Groove) thrust bearings which were critical components of the machine train. CKD Praha Energo had first become familiar with Kingsbury through use of an LEG-type KingCole bearing in the manufacture of turbo compressors. Kingsbury had formed an alliance with a long-established European bearing service provider, Coleherne Ltd. of Manchester, England, to build the unique bearings. The KingCole incorporates Kingsbury’s LEG technology and features a bearing-style familiar throughout Europe. For use in the Stramberk machine train, CKD decided on Kingsbury’s LEG bearing because of its higher load-carrying capacity and savings potential. The bearing features a 360º pad pivot design, conservative load ratings and a leading edge lubrication system that reduces operating temperatures which, in turn, reduce power losses and downtime. Compared to standard thrust bearings, the LEG reduces operating temperatures between 8º and 27ºC, depending on shaft speed. Based on that temperature reduction, the bearing provides a load carrying capacity increase of 15-20% percent. The LEG bearing operates at oil flow rates as much as 60% lower than standard flooded bearings, with up to a 40% reduction in friction losses. Peter Fahey, managing director of Coleherne Limited, received word of CKD’s satisfaction with the unique bearing. "They are very pleased with the LEG," noted Fahey. "They feel the bearing provides much better performance than the bearings they had used previously." Kingsbury’s LEG technology injects cool oil directly into the leading edge of the bearing pad, continuously flushing each pad with cool, filtered oil. Consequently, the surface temperature remains lower, contributing to an overall reduction in power loss. Because oil is injected directly into the bearing pad’s leading edge, the LEG uses half the oil of typical thrust bearing systems. In order to fully utilize the existing underground gas storage, the refurbishment project required a very flexible design capable of working under various operating conditions. The customer required wide ranges of suction and discharge pressures and capacities. They also emphasized the need for environmental preservation. This meant low consumption of fuel gas, high operation reliability and high maneuverability of the Stramberk machine train. The refurbishing project was divided into two phases. In both phases, the expected minimum pressure in the gas storage was 1.3 MPa. The first phase required exhausting gas from existing storage into the network with a pressure of 2.4 MPa. In the second phase, the machine train enabled operation with increased discharge pressure into the net work from 2.4 MPa to 4.0 MPa without any major changes. In this stage, the installation of a second machine train of the same type increased storage capacity by another 20%. CKD Praha Energo designed the centrifugal compressor based on long-term research and development activities. 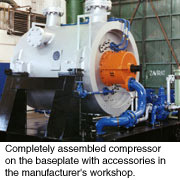 The compressor, which connects to the gas turbine by a non-lubricated elastic coupling, consists of two groups of stages arranged back-to-back in a vertically split casing. The heads of the casing contain the LEG bearing and seal housings. The operations seals are buffered with air to prevent natural gas from escaping. Performance tests confirmed the basic required parameters of the compressor. Its rated capacity measured 2.7 million Nm3 per day with an absolute discharge pressure of 2.4 MPa and specific energy consumption at coupling of 90.3 kJ/Nm3. The GT 3000 gas turbine, manufactured by SPE Mashproekt, Nikolaev, Ukraine, delivered a power output of 3,360kW at 31.5% efficiency. The GT 3000 features outstanding maneuverability with a readiness to start within 15 minutes. The system can also repeat the start-up process after shutdown during rotor movement. The underground gas storage refurbishment at Stramberk provides an environmental asset to the entire area by increasing the use of natural gas which is a safer and more environmentally-friendly source of primary energy. Therefore, it contributes to the policy of improving the environment in the Czech Republic, decreasing air, water and noise pollution in the region. The machine train, complete with Kingsbury’s LEG thrust bearing, exhibited and won the gold medal at the International Machine Trade Fair at Brno, Czech Republic in 1997. Jiri Kafka, CKD Praha Energo’s project head, realized the impact of incorporating the LEG bearing into the machine train. "Using the LEG bearing made it possible to reduce friction loss and oil flow. It also enabled us to design a centrifugal compressor for the project’s required parameters," noted Kafka. "The bearing contributed a great deal in helping the machine train win the gold medal at the trade fair." Following its showcase at the fair, CKD shipped the machine train to Stramberk for installation. The system has already aroused interest among several other gas companies, prompting them to consider a similar refurbishment in their own facilities.